Click to enlarge – looking south down Lillian Way from the corner of Eleanor. Buster trails Ward Crane in Sherlock Jr.
Click to enlarge – looking east down Eleanor from the corner of Lillian Way. Buster in Convict 13. Built prior to 1912, a pair of small bungalows once stood at 6206 and 6200 Eleanor, half a block east from the Keaton Studio front corner office. Remarkably the pair of homes was moved twice, first in 1920, and again in 1921. Even more remarkably, one of the pair survives today after being moved a third time in 1926. 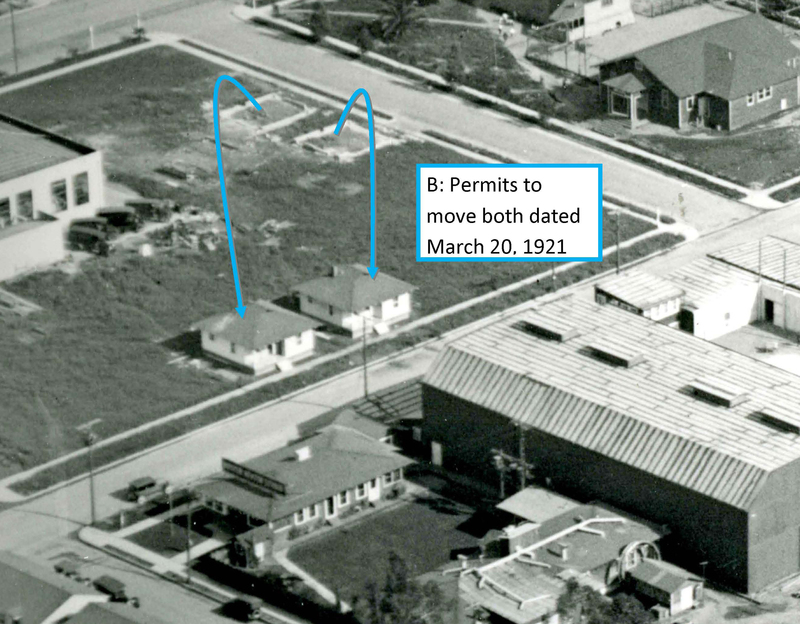 The Los Angeles Department of Building and Safety posts searchable historic building permits and other records online – accessible at https://www.ladbs.org/services/check-status/online-building-records. The permits tell an incredible story. 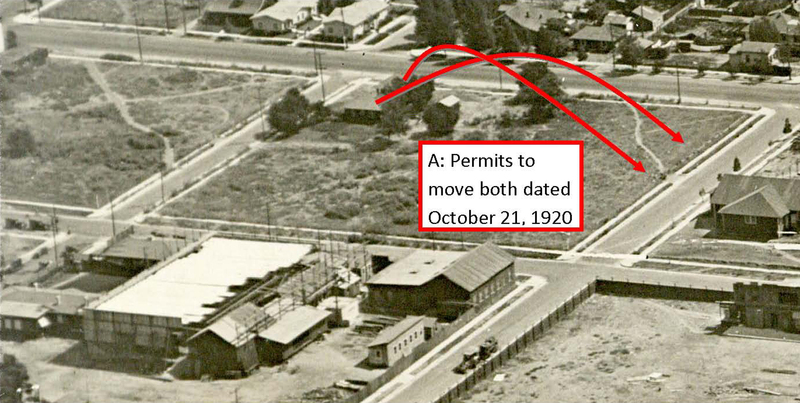 When the California Laundry purchased the corner of Eleanor and Vine in order to build a large two-story cement laundry building, it moved the pair of Eleanor bungalows a block south under permits issued on October 21, 1920. Click to enlarge. 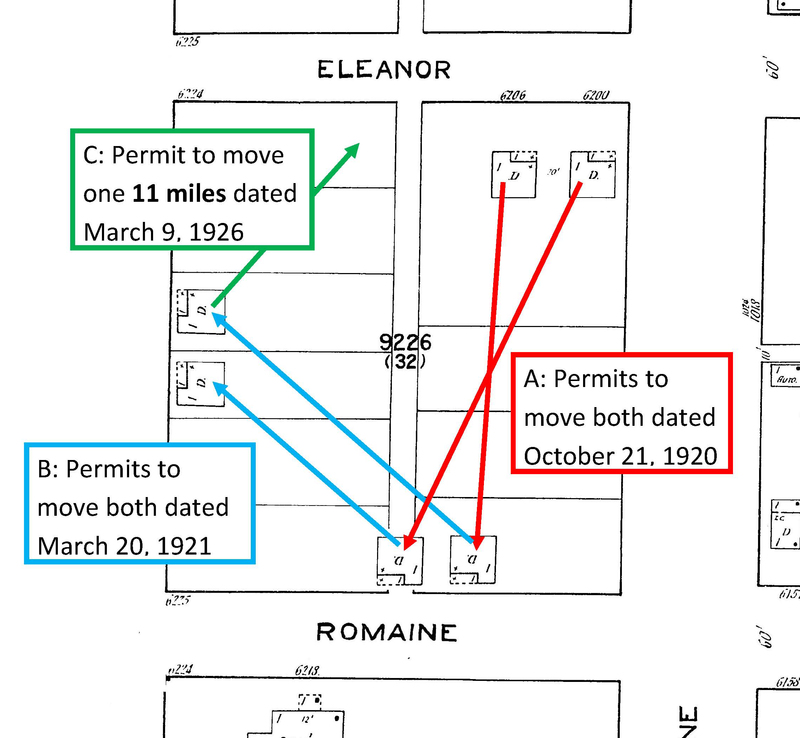 Step A – the homes are moved in 1920 from Eleanor to Romaine. Marc Wanamaker – Bison Archive. Above, looking NE with what would become the Buster Keaton Studio in the foreground, 6206 Eleanor is moved to 6207 Romaine; 6200 Eleanor is moved to 6209 Romaine. Click to enlarge. Step B – the homes are moved in 1921 from Romaine to Lillian Way. HollywoodPhotographs.com. For some reason, the California Laundry, owner of the bungalows, moved them again just 5 months later from Romaine to Lillian Way. Above, looking SE, 6209 Romaine moved to 1010 Lillian Way; 6207 Romaine moved to 1016 Lillian Way. Click to enlarge. Step C – the home at 1016 Lillian Way is moved in 1926 to 4908 McKinley Avenue. HollywoodPhotographs.com. Above, looking south, 1016 Lillian Way was moved again in 1926. 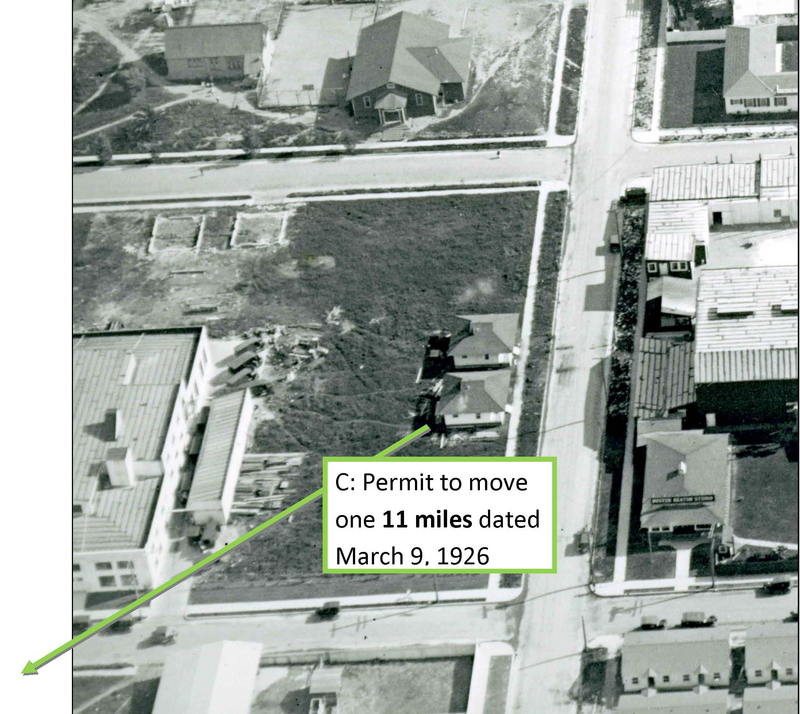 Notice the large California Laundry facility facing Eleanor, where the pair of homes originally stood, and the prominent foundations along Romaine where the pair of homes had recently stood. Three views of the same home. 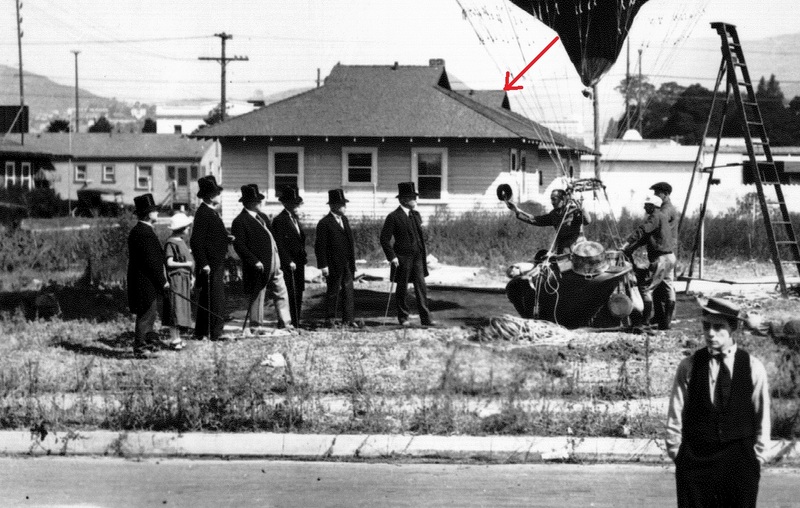 Click to enlarge – from The Balloonatic (1923) looking north at the bungalows, 1010 Lillian Way at front, 1016 Lillian Way (arrow) at back. I had always been intrigued by the pair of bungalows appearing so prominently in Keaton’s The Balloonatic (above), and somehow sensed they looked similar to the homes appearing in Convict 13 (further above). But it never occurred to me that they were the same homes, and I always assumed they had long since been demolished. That changed when I recently discovered three small duplexes built across from the Keaton Studio were moved in the 1940s and 1950s, and are still standing (see below). Realizing that homes were once commonly moved, I checked the city permits, and was stunned to learn this incredible story. 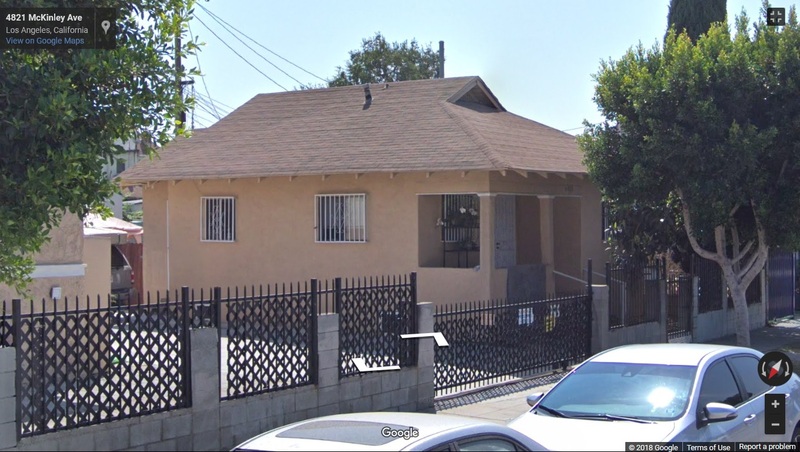 This duplex once adjacent to the Keaton Studio is still standing – read more at the link. Decades later, peripatetic homes that once stood watch over the Keaton Studio can rightfully claim a tangible link to early Hollywood history. Below, Keaton’s Sherlock Jr. co-star still standing at 4908 McKinley Avenue. This entry was posted in Keaton Studio, Sherlock Jr. and tagged Buster Keaton, Convict 13, Keaton Locations, Keaton Studio, Sherlock Jr., Silent Comedians, Silent Comedies, Silent Movie Locations, Silent Movies, then and now. Bookmark the permalink. You may or may not recall the messages, photos and updates I sent you after my visits to Cottage Grove and Culp Creek in April of 2015. Living in Ontario, I don’t and likely won’t have anything to add to your continued postings. We love taking all of these time travel adventures with you — thanks! Thank you – from what I’ve encountered it was fairly common back then to move houses. Frugal, but also a viable option, given how much open land there still was at the time. This is one of my all-time favorite, deep in the weeds discoveries. The story itself, and the fact there are tools available now to confirm this 95 years later, are both nearly beyond belief.